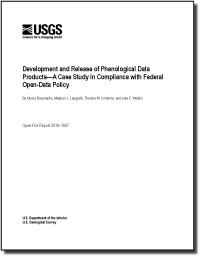 Jake joined the US Geological Survey in 2007 to design and implement the USA National Phenology Network. Since 2015 he has also served as the Program Manager for the Status & Trends Program in the Ecosystems Mission Area. Jake’s interest in natural history developed as he grew up in Alaska and served as an exchange student in the Australian outback. His interests range broadly -- from natural resource management to ecological- and ecosystem-level research -- across a variety of systems ranging from deserts to grasslands, savannas to forests, and even to wetlands. Jake is interested in how the structure and function of plant and animal populations, communities and ecosystems respond to global environmental change, including atmospheric chemistry, climate change, and biological invasions. He also studies how scientists understand and describe changes in ecosystems over space and time, from monitoring, to data management and analysis, to delivery of ecological knowledge and information to stakeholders. Current interests include citizen science, enterprise tools for monitoring, data visualization and delivery, and ecological forecasting. North American bats face unprecedented threats including habitat loss and fragmentation, white-nose syndrome, wind energy development, and climate change. NABat is an international interagency program designed to monitor bat distributions and abundances on public and private lands, and provide trend data at the state, provincial, tribal, regional, and range-wide scales. WLCI is a long-term, science-based program focused on assessing, conserving, and enhancing fish and wildlife habitats while facilitating responsible energy development through local collaboration and partnerships. We provide multidisciplinary scientific and technical information to WLCI partners and work to advance the overall scientific understanding of ecosystems in southwestern Wyoming. The USA National Phenology Network is a national-scale science and monitoring initiative focused on phenology, which is the study of seasonal life-cycle events such as leafing, flowering, reproduction and migration, as a tool to understand how plants, animals and landscapes respond to environmental variation and change. With 2015 marking its 50th anniversary, the BBS continues to provide critical science-based estimates of population change on more than 600 continental bird species annually to improve our understanding of how these federally entrusted species respond to environmental variation and ecosystem change. 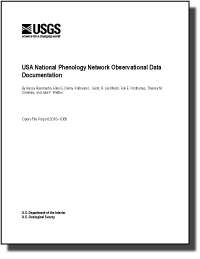 View this webinar to learn more about the USA National Phenology Network. Waller, Eric K.; Crimmins, Theresa M.; Walker, Jessica J.; Posthumus, Erin E.; Weltzin, Jake F.
The USA National Phenology Network is a federally-funded, nationalscale science and monitoring initiative focused on phenology as a tool to understand how plants, animals, and landscapes respond to environmental variation and change. Weltzin, Jake F.; Crimmins, Theresa M.; Posthumous, Erin; Rosemartin, Alyssaa; Gerst, Katharine L.
Bayer, Jennifer M.; Scully, Rebecca A.; Weltzin, Jake F.
Bayer, J.M., Scully, R.A., and Weltzin, J.F., 2018, MonitoringResources.org—Supporting coordinated and cost-effective natural resource monitoring across organizations: U.S. Geological Survey Fact Sheet 2018–3015, 2 p., https://doi.org/10.3133/fs20183015. Rosemartin, Alyssa H.; Denny, Ellen G.; Gerst, Katharine L.; Marsh, R. Lee; Posthumus, Erin E.; Crimmins, Theresa M.; Weltzin, Jake F.
Rosemartin, A., Denny, E.G., Gerst, K.L., Marsh, R.L., Posthumus, E.E., Crimmins, T.M., and Weltzin, J.F., 2018, USA National Phenology Network observational data documentation: U.S. Geological Survey Open-File Report 2018–1060, 24 p., https://doi.org/10.3133/ofr20181060. Wiggins, Andrea; Bonney, Rick; LeBuhn, Gretchen; Parrish, Julia K.; Weltzin, Jake F.
Rosemartin, Alyssa H.; Langseth, Madison L.; Crimmins, Theresa M.; Weltzin, Jake F.
Rosemartin, A., Langseth, M.L., Crimmins, T.M., and Weltzin, J.F., 2018, Development and release of phenological data products—A case study in compliance with federal open data policy: U.S. Geological Survey Open-File Report 2018–1007, 13 p., https://doi.org/10.3133/ofr20181007. Bayer, Jennifer M.; Weltzin, Jake F.; Scully, Rebecca A.
Bayer, J.M., Weltzin, J. F., and Scully, R.A. 2017. 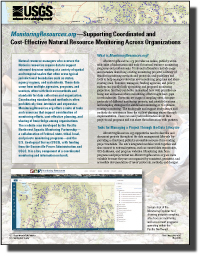 Developing Enterprise Tools and Capacities for Large-scale Natural Resource Monitoring: A Visioning Workshop. (https://www.pnamp.org/document/5990). Weltzin, Jake F.; Crimmins, Theresa M.; Posthumus, Erin E.; Rosemartin, Alyssa H.
Crimmins, Theresa M.; Crimmins, Michael A.; Gerst, Katherine L.; Rosemartin, Alyssa H.; Weltzin, Jake F.
Rapid carbon response of peatlands to climate change. Ecology 89:3041-3048. Can community composition be predicted from pairwise species interactions? The biogeography of prediction error: Why does the introduced range of the fire ant over predict its native range? Weltzin, J.F., R. T. Belote, L.T. Williams, J.K. Keller, and E.C. Engel. 2006. Authorship in ecology: attribution, accountability, and responsibility. Frontiers in Ecology and the Environment 4:435-441. DOI: 10.1890/1540-9295(2006)4[435:AIEAAA]2.0.CO;2 [Reply to comments: Weltzin, J.F., R. T. Belote, L.T. Williams, J.K. Keller, and E.C. Engel. 2007. Ensuring that “authors” write - the authors reply. Frontiers in Ecology and the Environment 5:11]. Potts, D.L., T.E. Huxman, B.J. Enquist, J.F. Weltzin, and D.G. Williams. 2006. Resilience and resistance of ecosystem functional response to a precipitation pulse in a semi arid grassland. Journal of Ecology 94:23-30. DOI: 10.1111/j.1365 2745.2005.01060.x. Cole, P.G. and J.F. Weltzin. 2005. Light limitation creates patchy distribution of a non-native grass in eastern deciduous forests. Biological Invasions 7:477-488. Weltzin1, J.F., J.K. Keller1, S.D. Bridgham, J. Pastor, P.B. Allen, and J. Chen. 2005. Litter as a control on fen plant community composition and production. Oikos 110:537-546. 1Authors contributed equally. Fitzpatrick, M.C. and J.F. Weltzin. 2005. Ecological niche models and the geography of biological invasions: a review and a novel application. Pages 45-60 in Inderjit, editor. Ecological and Agricultural Aspects of Invasive Plants. Birkhauser Verlag/Switzerland. Sanders, N.J., R.T. Belote and J.F. Weltzin. 2004. Multi trophic effects of elevated CO2 on understory plant and arthropod communities. Environmental Entomology 33:1609-1616. The effects of infrared loading and water table on soil energy fluxes in northern peatlands. Noormets, A., J. Chen, S.D. Bridgham, J. Pastor, J.F. Weltzin, B. Dewey, and J. LeMoine. 2004. The effects of infrared loading and water table on soil energy fluxes in northern peatlands. Ecosystems 7:573-582. Chesson, P., R.L.E. Gebauer, S. Schwinning, N. Huntly, K. Wiegand, M.S.K. Ernest, A. Sher, A. Novoplansky, and J.F. Weltzin. 2004. Resource pulses, species interactions, and diversity maintenance in arid and semi arid environments. Oecologia 141:236-253. Environmental correlates of the distribution and abundance of Microstegium vimineum in East Tennessee, USA. Cole, P.G. and J.F. Weltzin. 2004. Environmental correlates of the distribution and abundance of Microstegium vimineum in East Tennessee, USA. Southeastern Naturalist 3:545-562. Convergence across biomes to a common rain-use efficiency. Huxman1, T.E., M.D. Smith1, P.A. Fay, A.K. Knapp, M.R. Shaw, M.E. Loik, S.D. Smith, D.T. Tissue, J.C. Zak, J.F. Weltzin, W.T. Pockman, O.E. Sala, B. Haddad, J. Harte, G.W. Koch, S. Schwinning, E.E. Small, and D.G. Williams. 1Authors contributed equally. 2004. Convergence across biomes to a common rain-use efficiency. Nature 429:651-654. Belote, R.T., J.F. Weltzin, and R.J. Norby. 2004. Response of an understory plant community to elevated [CO2] depends on differential responses of dominant invasive species and is mediated by soil water availability. New Phytologist 161:827-835. Huxman, T.E., J.M. Cable, D. D. Ignace, J.A. Eilts, N.B. English, J.F. Weltzin, and D.G. Williams. 2004. Response of net ecosystem gas exchange to a simulated precipitation pulse in a semi-arid grassland: the role of native versus non-native grasses and soil texture. Oecologia 141:295 305. English, N.B., D.G. Williams, and J.F. Weltzin. 2003. Soil temperature and moisture dynamics after experimental irrigation on two contrasting soils on the Santa Rita Experimental Range: implications for mesquite establishment. Pages 188-192 in McClaran, M.P., P.F. Ffolliott, and C.B. Edminster, tech coords. Santa Rita Experimental Range: 100 Years (1903 2003) of Accomplishments and Contributions. USDA Forest Service Proceedings RMRS-P-30. Weltzin, J.F., M.E. Loik, S. Schwinning, D.G. Williams, P. Fay, B. Haddad, J. Harte, T.E. Huxman, A.K. Knapp, G. Lin, W.T. Pockman, M.R. Shaw, E. Small, M.D. Smith, S.D. Smith, D.T. Tissue, and J.C. Zak. 2003. Assessing the response of terrestrial ecosystems to potential changes in precipitation. BioScience 53:941-952. Weltzin, J.F., N.Z. Muth, B. VonHolle, and P.G. Cole. 2003. Genetic diversity and invasibility: a test using a model system with a novel experimental design. Oikos 103:505-518. Price, C.A. and J.F. Weltzin. 2003. Managing non-native plant populations through intensive plant community restoration in Cades Cove, Great Smoky Mountains National Park, USA. Restoration Ecology 11:351-358. Drake, S.J., J.F. Weltzin, and P.D. Parr. 2003. Assessment of non-native invasive plants on the National Environmental Research Park at Oak Ridge National Laboratory. Castanea 68:15-30. Weltzin, J.F. and P.B. Allen. 2003. Tree seedling recruitment in temperate deciduous forest: interactive effects of soil moisture, light, and slope position. Pages 217 - 226 in Hanson, P.J. and S.D. Wullschleger, eds. North American temperate deciduous forest responses to changing precipitation regimes. Ecological Studies, Volume 166. Springer Verlag, New York. Biological invaders in a greenhouse world: will elevated CO2 fuel plant invasions? Weltzin, J.F., R.T. Belote, and N.J. Sanders. 2003. Biological invaders in a greenhouse world: will elevated CO2 fuel plant invasions? Frontiers in Ecology and the Environment 1:146-153. Weltzin, J.F., S.D. Bridgham, J. Pastor, J. Chen, and C. Harth. 2003. Potential effects of warming and drying on peatland plant community composition. Global Change Biology 9:141-151. Weltzin, J.F. and D.T. Tissue. 2003. Resource pulses in arid environments - patterns of rain, patterns of life. New Phytologist 157:171-173. Weltzin, J.F. and G.R. McPherson. 2003. Assessing response of terrestrial populations, communities, and ecosystems to changes in precipitation regimes: progress to date and future directions. Pages 180-188 in Weltzin, J.F. and G.R. McPherson, eds. Changing Precipitation Regimes and Terrestrial Ecosystems: A North American Perspective. University of Arizona Press, Tucson. Pastor, J., B. Peckman, S.D. Bridgham, J.F. Weltzin, and J. Chen. 2002. Plant community dynamics, nutrient cycling, and alternative stable equilibria in peatlands. American Naturalist 160:553-568. R.J. Norby, P.J. Hanson, E.G. O'Neill, T.J. Tschaplinski, J.F. Weltzin, R.T. Hansen, W. Cheng, S.D. Wullschleger, C.A. Gunderson, N.T. Edwards, and D.W. Johnson. 2002. Net primary productivity of a CO2-enriched deciduous forest and the implications for carbon storage. Ecological Applications 12:1261-1266. Weltzin, J.F., K.A. Snyder, and D.G. Williams. 2001. Experimental manipulations of precipitation seasonality: effects on oak (Quercus) seedling demography and physiology. Western North American Naturalist 61:463-472. Weltzin, J.F., C. Harth, S.D. Bridgham, J. Pastor, and M. Vonderharr. 2001. Production and microtopography of bog bryophytes: response to warming and water-table manipulations. Oecologia 128:557-565. Weltzin, J.F., J. Pastor, C. Harth, S.D. Bridgham, K. Updegraff, and C.T. Chapin. 2000. Response of bog and fen plant communities to warming and water-table manipulations. Ecology 81:3464-3478. Williams, D.G., G.R. McPherson, and J.F. Weltzin. 1999. Stress in wildland plants: implications for ecosystem structure and function. Pages 907 929 in M. Pessarakli, ed. Handbook of plant and crop stress, second edition. Marcel Dekker, New York, NY. Weltzin, J.F., S.L. Dowhower, and R.K. Heitschmidt. 1997. Prairie dog effects on plant community structure in southern mixed-grass prairie. Southwestern Naturalist 42:251-258. Weltzin, J.F. and G.R. McPherson. 1997. Spatial and temporal soil moisture resource partitioning by trees and savannas in a temperate savanna, Arizona, USA. Oecologia 112:156-164. Weltzin, J. F. and M.B. Coughenour. 1990. Savanna tree influence on understory vegetation and soil nutrients in northwestern Kenya. Journal of Vegetation Science 1:325-334.